Background: The anaplastic lymphoma kinase (ALK) gene rearrangement is a predictive and prognostic marker in pulmonary adenocarcinoma. A series of clinical and pathological features have been documented in patients who harbor this translocation. Aims: The objectives of this study were to analyze the specific cytomorphological features of lung adenocarcinoma that harbored the ALK gene rearrangement and to compare the morphological features with the mutation-negative cases. Materials and Methods: The study sample of 40 cases included 15 ALK-positive cases and 25 ALK-negative cases. After the diagnosis was established, testing for ALK rearrangement was on the histopathology sample. 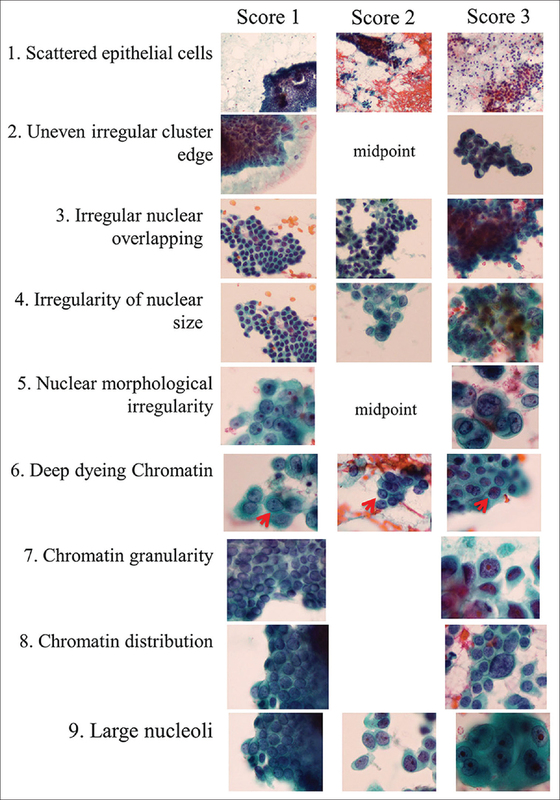 The corresponding fine-needle aspiration cytology slides were retrieved from the records and cytomorphological features were analyzed. Results: A comparison of pattern between the ALK-positive and ALK-negative group revealed that the sheet-like pattern and singly scattered cells were more common in the ALK-positive group. Moderate-to-severe nuclear pleomorphism was identified in 80% of ALK-positive cases and 72% of ALK-negative cases. The presence of mucinous features and/or signet ring morphology was the most striking feature of ALK-positive cases with P value of 0.002. The presence of necrosis in the background was identified in 80% of ALK-positive cases and was statistically significant (P = 0.001). 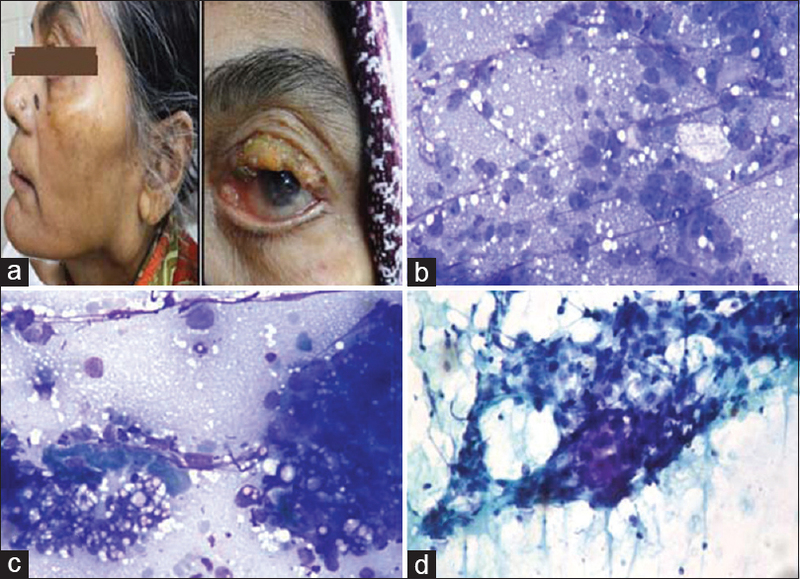 Conclusion: This is among the few studies from India, where a detailed analysis of the cytomorphological features of cases with ALK phenotype versus the mutation negative cases has been performed. Background: Lung cancer is a leading cause of deaths attributed to cancer worldwide. Epidermal growth factor receptor (EGFR) mutation and anaplastic lymphoma kinase (ALK) rearrangement are commonly found in patients of adenocarcinoma lung against, which targeted therapy is available. In this era of personalized medicine, it is a rationale to detect these molecular alterations in cases of lung carcinomas. Aims: The objectives were to compare the diagnostic efficacy of cytological samples for the detection of EGFR and ALK protein expression using immunocytochemistry in nonsmall cell lung carcinoma. Materials and Methods: We compared 22 cell blocks and biopsies for the detection of EGFR and ALK protein expression by immunohistochemistry (IHC). EGFR IHC was performed using EGFR Receptor (E746-A750 del Specific) (6B6) monoclonal antibody and ALK IHC was done using Ventana anti-ALK (D5F3) monoclonal primary antibody. Results: Two cases were found to be positive; 20 cases were negative for EGFR IHC both in biopsies and cell blocks. ALK IHC was positive in one case; negative in 21 cases. The results of IHC were also concordant for biopsies and cell blocks. The sensitivity and specificity were 100% for immunocytochemical detection of ALK and EGFR in cell blocks with respect to biopsies. Conclusion: We conclude that cell blocks can serve as a potential substitute for biopsies for detection of EGFR and ALK protein by immunocytochemistry, whenever patient presents with effusion and biopsy cannot be done or when tissue is not adequate. 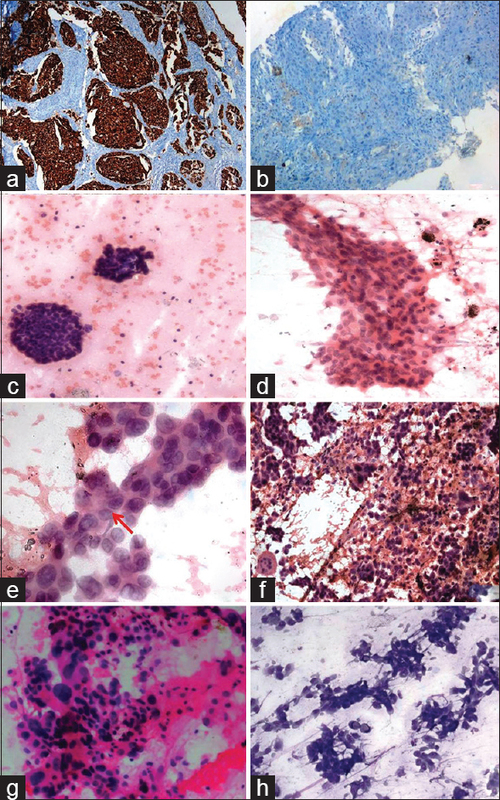 Background: Among all diagnostic techniques for breast lesions, fine-needle aspiration (FNA) is the simplest, most reliable and cheapest one. Aim: To compare liquid-based and conventional cytology in diagnosis of breast mass. Materials and Methods: About 101 patients with breast mass were enrolled. The aspirated materials were divided into two parts. One was poured into a liquid medium and the other part was directly spread on clean glass slides. Conventional and liquid-based preparations were compared using several criteria including adequacy (presence of the epithelial cluster or myoepithelial cells), overall cellularity, presence of single epithelial cells, presence of myoepithelial cells, epithelial architecture, nuclear detail, nuclear atypia and inflammatory/proteinaceous background and final diagnosis. Results: Among 101 cases, 85 (84.1%) were malignant and 16 (15.9%) were benign. 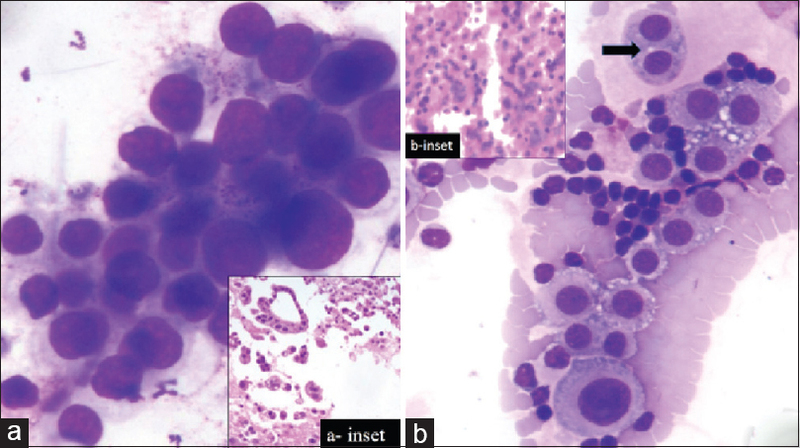 Conventional and liquid-based cytology were similar according to adequacy (P = 0.65), cellularity (P = 0.13), epithelial architecture (P = 0.15), presence of myoepithelial cells (P = 0.61), nuclear detail (P = 0.57) and nuclear atypia (P = 0.44), while there were a significant difference between the two methods according to the presence of single epithelial cells (P < 0.001) and background (P < 0.001). Conclusion: Liquid-based cytology of breast specimens is an accurate diagnostic tool with high diagnostic yield in benign and malignant lesions. Introduction: Although cytological examination helps in diagnosis of malignancy in serous effusion, at times it is difficult to differentiate atypical reactive mesothelial cells from adenocarcinoma (AC) cells. To resolve this problem, various ancillary methods have been used. Immunocytochemistry (ICC) is one such commonly used technique in which various panel of antibodies has been tried. Unfortunately, so far no unique marker is available to solve this issue. Hence, the present study evaluates the efficacy of four antibody panel comprising of MOC-31, epithelial membrane antigen (EMA), calretinin (CAL), and mesothelin (MES) to solve this problem. Materials and Methods: Forty-two cases suspected of malignant effusion in pleural/peritoneal fluid and 42 cases of reactive effusion were included. 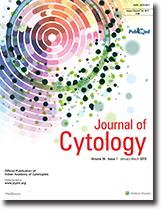 Cytospin smears were prepared and stained with Giemsa stain for cytomorphological diagnosis. Cytospin smears and cell blocks were made forICC. ICC for MOC-31, EMA, CAL, and MES was performed. Results: Among the suspected malignant effusion cases, 30 cases were AC and 12 cases were suspicious for malignancy by cytomorphology. MOC31 demonstrated 100% sensitivity (Sn) and 95.24% specificity (Sp), and EMA had 88.1% Sn and 92.86% Sp for AC cases. CAL demonstrated 100% and 97.62%, and MES 97.62% and 88.1% Sn and Sp in reactive mesothelial cells, respectively. Conclusion: In conclusion, combination of MOC-31 and CAL as a limited panel will be helpful in giving an appropriate diagnosis in difficult cases and thereby, help in patient management. In addition, ICC on cytospin smears gave results similar to cell blocks, and if standardised cytospin is simple technique to perform, unlike cell blocks. 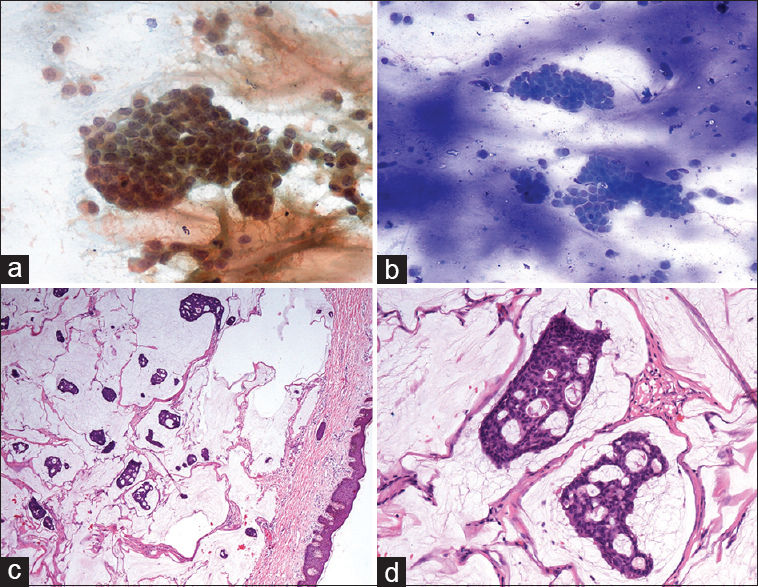 Context: Despite sputum cytology being accepted as a simple and noninvasive diagnostic method for lung cancer, the clinical usefulness of sputum for evaluation of prognosis is yet to be explored. Validation of some of the markers in sputum for prognosis prediction will be highly useful for selective therapy. Aims: This study was aimed to evaluate a reliable panel of immunocytochemical markers for their significance to predict survival. Materials and Methods: We have analyzed the expression of p53, p16, galectin-3, and epidermal growth factor receptor (EGFR) proteins in sputum samples processed in a mucolytic agent/cellblock and compared the same with that of the corresponding tissue samples. Results: Overexpression of p16 and EGFR was found to have a better survival benefit, whereas positive p53 and galectin-3 expressions had shorter period of survival. 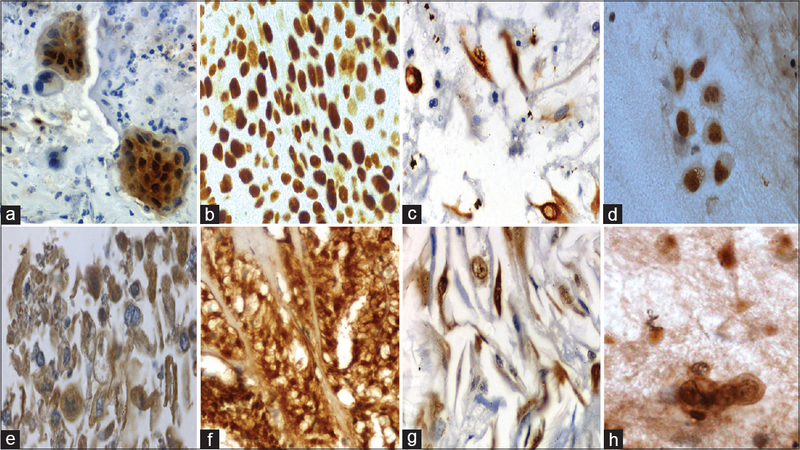 Expression patterns of all these four proteins were more or less similar in smears, cellblocks of sputum, and tissue samples except for slight changes in staining intensity which was not found to be statistically significant. No significant difference was found in the association of these proteins with survival pattern between sputum and tissue samples. Conclusion: This is the first report of immunocytochemistry of a panel of markers on cells exfoliated in sputum samples which suggests that analysis of immunocytochemical markers in sputum samples can be attempted as a cost-effective and reliable predictor of prognosis and survival. Accumulation of mutated p53, overexpression of galectin-3, and lower expression of p16 and EGFR proteins were found to predict poor prognosis for lung cancer. Context: Pyogenic meningitis is often a devastating condition which is diagnosed by analysis of cerebrospinal fluid (CSF) obtained by lumbar puncture (LP). CSF thus obtained can get contaminated with peripheral blood leucocytes during LP which renders it unusable for cytological analysis. Leucocyte esterase strips are available for identifying leucocyte esterase activity in urine and other body fluids which suggest inflammation. We conducted this experiment to see whether the leucocyte esterase strip can differentiate between neutrophils invited at the inflammatory site and circulating neutrophils in CSF. Aim: To compare the diagnostic ability of the leucocyte esterase test between pyogenic meningitis and CSF contaminated with circulating neutrophils. Setting and Design: Prospective analytical study conducted in a tertiary care hospital. 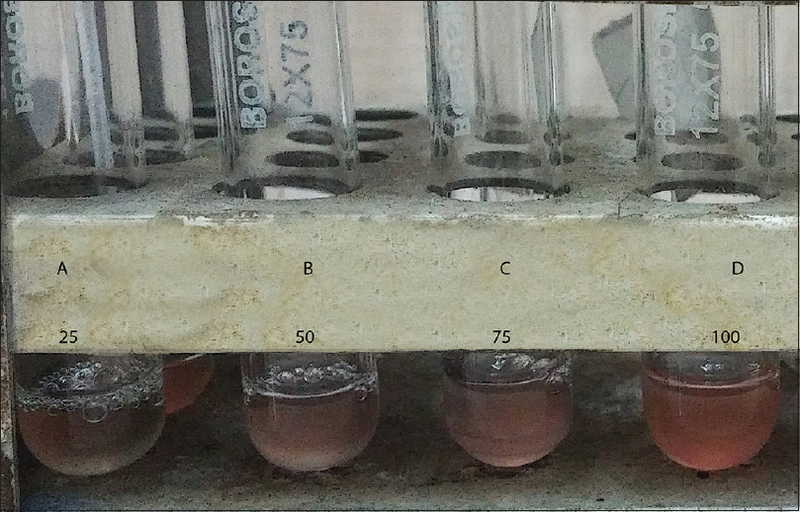 Materials and Methods: The CSF samples of pyogenic meningitis patients were analyzed for leucocyte esterase activity. The other group was normal CSF which was deliberately contaminated with buffy coat preparation, and leukocyte esterase activity was determined. Statistical Analysis: Diagnostic ability of a test in terms of sensitivity and specificity. Results: Overall sensitivity of the dipsticks in diagnosing pyogenic meningitis is 81% and specificity is 99%. When compared with experimentally contaminated CSF sample, a reading of 2+ on the strip had a sensitivity of 70% and specificity of 100% for pyogenic meningitis. Conclusion: Leucocyte esterase strip is specific for pyogenic meningitis (activated neutrophils), and hence can differentiate from CSF contaminated with blood. 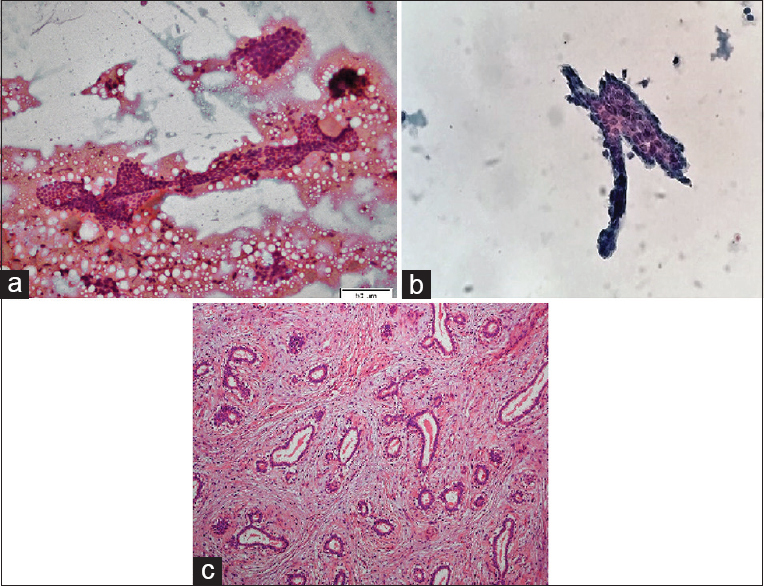 Context: Fine needle aspiration (FNA) plays a crucial role in the evaluation of patients with thyroid lesions. 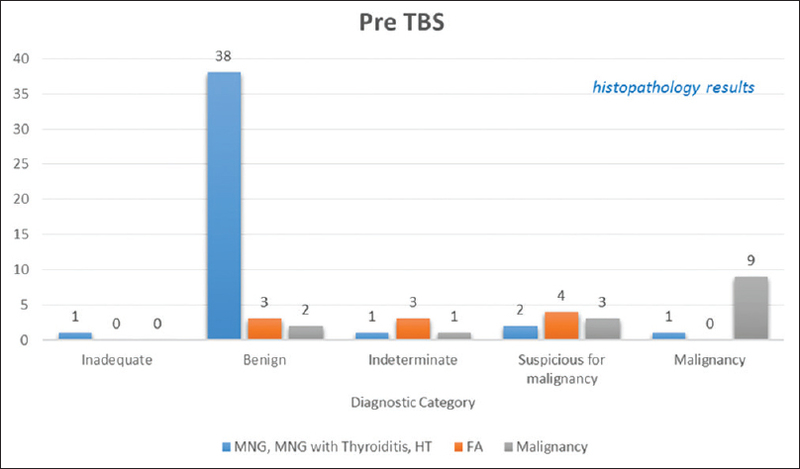 The Bethesda system for reporting thyroid cytopathology (TBSRTC) was designed with a mission to standardize the process of diagnosis and management of thyroid lesions by FNA cytology (FNAC). Aim: We aim to see the benefits of adopting TBSRTC, seek the cytological pitfalls in the diagnosis of thyroid FNAC, and identify the spectrum of thyroid lesions in our setup. Settings and Design: This is a hospital-based cross-sectional study conducted from June 2009 to June 2014 of all thyroid FNACs with available histopathology reports. Cases were designated a specific diagnostic category according to TBSRTC. Materials and Methods: A total of 109 cases were included in the study. Sixty-eight cases had been reported without using TBSRTC and were reviewed and reclassified according to TBSRTC seeking the common reasons for interpretative errors. Statistical Analysis Used: Data were analyzed using SPSS ver. 11.5. Results: In both pre- and post-TBSRTC era, benign neoplasms constituted the major bulk. After the use of TBSRTC, there was increased ability to look for follicular neoplasms, improvement in making definitive diagnosis of the cases, decline in the suspicious category, and an improvement in diagnostic accuracy, and we were in line with the implied risk outlined by TBSRTC in most of the cases except the nondiagnostic or unsatisfactory category. Conclusion: Application of TBSRTC results in uniformity in reporting among pathologists and better interdisciplinary communication and patient management. Aim: The objective of this study was to apply a scoring method to fine needle aspiration cytology on breast duct dilatation and cystic lesions, to set an optimum cut-off value to differentiate between benign and malignant cases, and to identify features useful for cell judgment. Materials and Methods: Samples were 23 preparations of specimens (12 benign and 11 malignant cases) suspected with intraductal lesions or cystic change by ultrasonography or mammography and cytology. The scoring system comprised the following 10 items, and each item was scored 1–3, with a total score of 10–30. Three items were concerning structural atypia: 1, scattered epithelial cells; 2, uneven irregular cluster edge; and 3, overlapping nuclei of epithelial cells, and seven items were concerning cellular atypia: 4, irregular nuclear size; 5, irregular nuclear morphology; 6, deep dyeing chromatin; 7, chromatin granularity; 8, chromatin distribution; 9, nucleolus; and 10, absence of myoepithelial cells. Results: (1) Scoring cut-off value: malignancy is to be suspected when the score is 20.75 or higher (diagnostic accuracy: 95.7%). (2) Findings useful for cancer judgment: the sensitivity of the following four findings was high: uneven irregular cluster edge, irregular nuclear overlapping, chromatin granularity, and absence of myoepithelial cells. (3) Correlation among the findings: the findings correlated with malignancy were as follows: scattered epithelial cells versus uneven irregular cluster edge (rs = 0.8). Conclusion: Cytological evaluation by scoring lesions accompanied by intraductal dilatation and cystic change was a useful method capable of differentiating between benign and malignant cases at a high accuracy. Endobronchial ultrasound-guided transbronchial needle aspiration (EBUS-TBNA) has recently emerged as a minimally invasive and safe modality for the evaluation of mediastinal lymphadenopathy, particularly in staging of lung carcinoma patients. In high tuberculosis endemic countries, EBUS-TBNA is useful in obtaining tissue diagnosis of granulomatous inflammation. Role of EBUS-TBNA in workup of extrapulmonary malignancies is not widely described. Herein, a brief overview of importance of EBUS-TBNA in investigation of extrapulmonary lesions/malignancies is presented. The treatment of non-small cell lung cancer (NSCLC) includes surgical resection with curative intent in early-stage disease and chemoradiation in the advanced stage disease. Therefore, an accurate preoperative mediastinal lymph node staging is required not only to offer the appropriate treatment but also to avoid unnecessary invasive procedures including thoracotomy. The mediastinal lymph nodes can be sampled using several techniques including mediastinoscopy, surgery (open or video-assisted thoracoscopic surgery), endobronchial ultrasound (EBUS)-guided transbronchial needle aspiration (TBNA), or endoscopic ultrasound (EUS)-guided fine needle aspiration (FNA). Currently, EBUS-TBNA/EUS-FNA is the preferred modality for sampling mediastinal lymph nodes because of its minimally invasive nature and high diagnostic yield. In this review, we discuss the utility of endosonographic procedures in mediastinal lymph node staging of NSCLC. Intrathoracic lymphadenopathy is a common problem encountered in clinical practice and is caused by a wide variety of diseases. 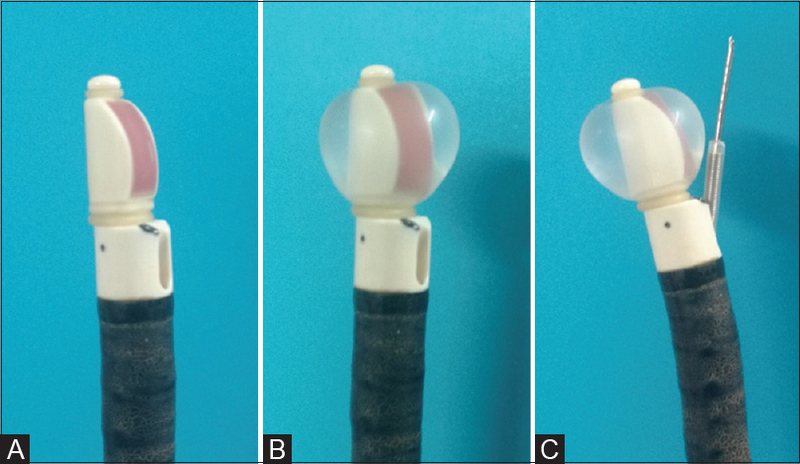 Traditionally, the mediastinal lymph nodes were sampled using conventional transbronchial needle aspiration (TBNA), or surgical methods such as mediastinoscopy, and thoracotomy (open or video-assisted thoracoscopy). However, surgical modalities including mediastinoscopy are invasive, expensive, and not universally available. Moreover, they are associated with considerable morbidity and mortality. Conventional TBNA although minimally invasive has a low diagnostic yield. In the last decade, endobronchial ultrasound-guided TBNA (EBUS-TBNA) has emerged as the diagnostic procedure of choice in evaluating undiagnosed intrathoracic lymphadenopathy. EBUS-TBNA is also currently the preferred modality in the mediastinal staging of lung cancer. The procedure is minimally invasive, safe, and can be performed as a day-care procedure. In the era of personalized medicine in lung cancer, optimizing the procedure, sample collection, and processing are crucial, as more tissue is required for performing a wide array of molecular tests. Despite its widespread use and acceptance, the diagnostic sensitivity of EBUS-TBNA is still low. 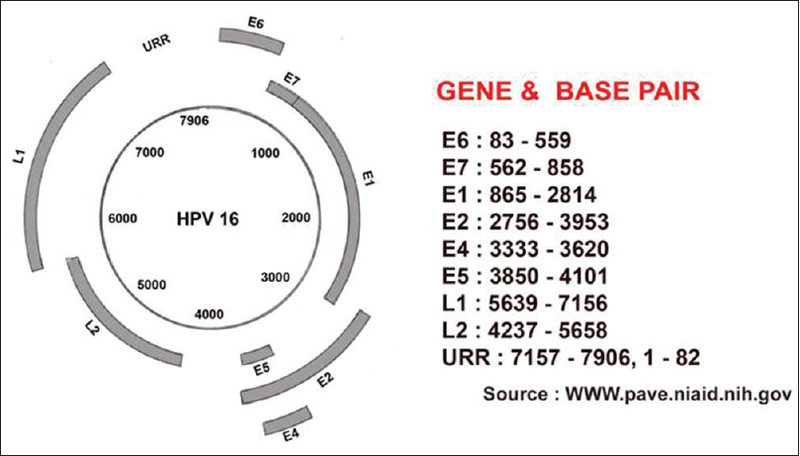 To maximize the yield, cytologists and physicians should be aware of the technical details of the procedure. 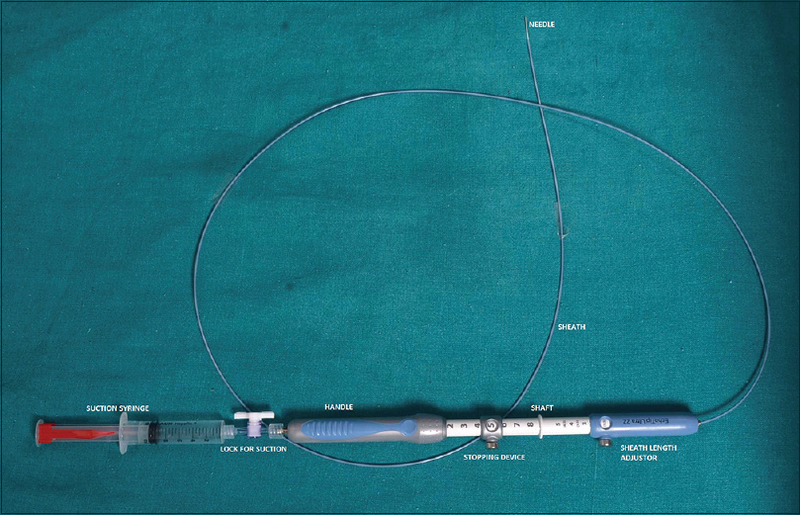 Herein, we discuss the technique of performing EBUS-TBNA, its indications, contraindications, and the processing of the samples at our bronchoscopy suite. We also highlight the challenges faced by the cytologists and clinicians while processing EBUS aspirates.